This is part three of a paper I wrote in grad school on C. S. Lewis and Postmodernism. You can read part one here, and part two here. A third echo of C. S. Lewis also came out of Derrida’s “Structure, Sign, and Play”, this one on the subject of “Being as presence” and the “series of substitutions of center for center, as a linked chain of determinations of the center. Successively, and in a regulated fashion, the center receives different forms or names” (279). 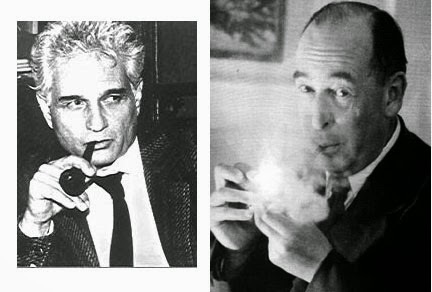 Derrida is arguing that meaning is never complete in the moment because speech is absence; the “real” object, (the signified), is being referred to by an infinite substitution of words (the signs) thereby distancing the person farther and farther away from the “real” thing. Lewis believed that “the relationship between sign and signified was much broader than the cognitive act of assigning abstract symbols to ideas and experiences … [he] understood that the meaning of meaning is much larger, preceding abstraction, reason, and even language, and his understanding has implications, not only on a proper understanding of the nature of meaning, but also on our understanding of myth, truth, allegory, metaphor, epistemology, and even the nature of heaven” (Starr). Lewis depicts this idea of concrete meaning vs. abstract shadows of thoughts and words in many of his works including The Great Divorce: “hitherto you have experienced truth only with the abstract intellect. I will bring you where you can taste it like honey and be embraced by it as by a bridegroom” (43). Lest anyone think C. S. Lewis was a radical postmodernist, it is prudent to point out one of the biggest obstacles: in The Abolition of Man, Lewis writes against the philosophy that assumes that all values are subjective, declaring the existence of the "reality beyond all predicates", "the Tao" (18). The Tao as defined by Lewis is "the doctrine of objective value, the belief that certain attitudes are really true, and others really false" (18). He discusses the inconsistencies in the theory that says all values are subjective when in the very act of making that statement the person who has made the statement has placed value on one not believing that any value would be absolute. 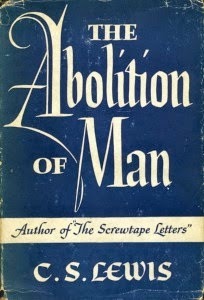 Lewis, C. S. The Abolition of Man. New York: Harper Collins, 2001. ---. The Great Divorce. New York: Collier, 1946. Starr, Charlie. “Meaning, Meanings, and Epistemology in C. S. Lewis.” Mythlore: A Journal of J.R.R. Tolkien, C.S. Lewis, Charles Williams, and Mythopoeic Literature. Spring/Summer 2007. Issue 97/98, Volume 25, Number 3/4. 161-182. ed. Janet Brennan Croft. Altadena, CA: The Mythopoeic Society, 2007.